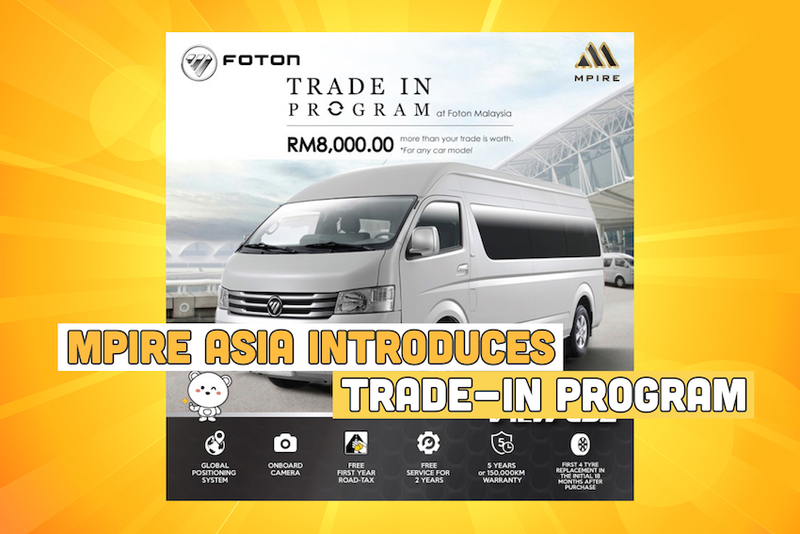 Mpire Asia is launching the exclusive Trade in Program for Foton View CS2, which RM8,000.00 will be subsidize for any vehicles traded in with the condition of buying a brand-new Foton View CS2 (terms and condition apply). On top of that this package also inclusive of Free 2 years service, Free onboard camera, Free first year road-tax, Free global positioning system, Free first 4 tyres replacement for the within 18 months period after purchase and lastly 5years or 150,000KM warranty. The Trade in Program is only valid from 28th February 2019 till 30th April 2019. So be quick. To further inquire about the all new FOTON VIEW CS2, kindly contact Mpire Asia Sdn Bhd at 03-5567 9858 / 012- 221 9111 or visit them at No.2, Jalan Pemberita U1/49, Temasya Industrial Park, 40150 Shah Alam, Selangor or log on to fotonmalaysia.com.my.